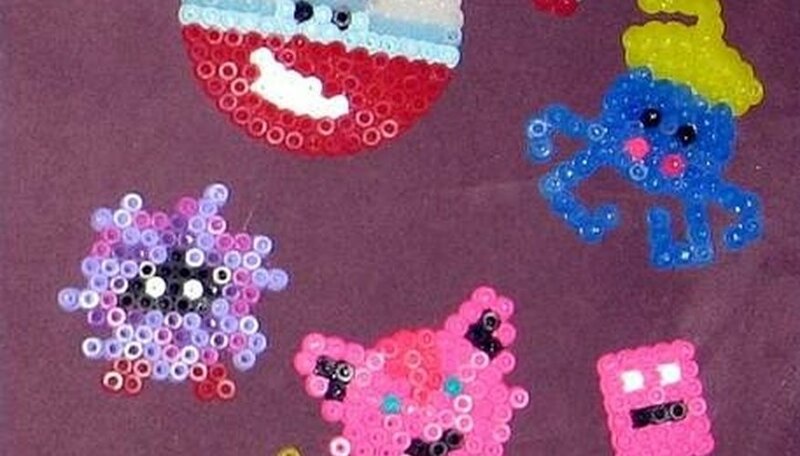 Perler beads are round, plastic craft beads that have a flat edge, like a tube bead. You place them on pegboards to create designs, then iron the beads for 30 seconds under parchment paper to fuse the beads together. The beads come in a full range of colors including glitter beads and glow-in-the-dark beads. The pegboards are available in a variety of shapes to make round designs, square designs or even animal-shaped designs. Because Perler beads are round, it's easy to thread a loop of string through a bead at the top of a finished project to create a hanging ornament or window decoration. The round Perler pegboard can be used for creating a ball ornament or a snowflake to hang on your tree. Square pegboards with their straight rows make creating a "gift box" ornament easy. Custom-shaped pegboards are designed to render a specific object such as a dolphin, fish or flower, but you can also use them to create other objects that fit within the special shape, such as designing a lollipop using the flower with stem pegboard. You can purchase the different boards separately or as part of a bead kit at craft stores. 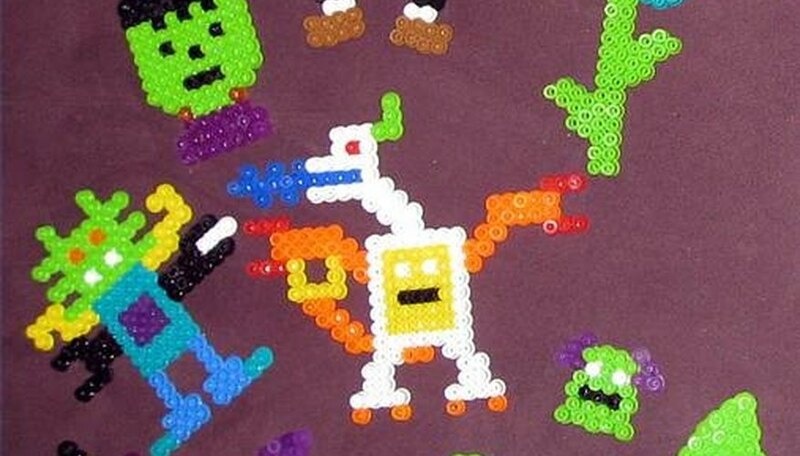 Use Perler beads to make your favorite TV or video game characters, such as Mario or Pokémon. It's a fun challenge to see how accurate a design you can make given the grid of pegs you have to work with. Find a good picture of your character on the Internet or in a print publication to serve as a guide. Then choose a Perler bead board that suits the shape of the character best. For example, if the character is mostly round, the circle board will probably work best. Animal-shaped boards may be helpful if your character is based on a real animal. Use the monkey pegboard, for example, if you'd like to create Curious George out of Perler beads. Place a small cluster of Perler beads on a pegboard or create a small design and iron. Then use a large jump ring to attach the Perler bead object to an earring wire for instant earrings. You could do the same to create a pendant for a necklace or a "bob" for a key chain. If you create Perler Bead designs with slots in them, you can fit them together after ironing to create three-dimensional objects that stand on their own such as trees, houses or animals. You would construct them the same way as standing cardboard cutouts with base pieces that sit at right angles to the central object to hold it upright.